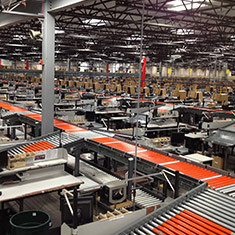 Eric Shrago reviewed distribution center infrastructure with an emphasis on motor efficiency, conveyor belt design and layout, sensor functioning and operational usage. The adidas Group hosted Eric Shrago as its 2014 EDF Climate Corps fellow. He focused on Material Handling Equipment at distribution centers, and his supervisor, Elizabeth Turnbull Henry, was herself an EDF Climate Corps fellow in 2010 at the adidas Group. Shrago reviewed the infrastructure in the main US distribution center in Spartanburg, SC with an emphasis on motor efficiency; conveyor belt design, specification and layout; sensor functioning and locations; and operational usage. Additionally, Shrago explored various retrofit opportunities for the Spartanburg, SC operation. These included upgrading motors, replacing existing belts with more efficient rollers and adding more sensors. His goal was to see if any retrofit opportunities would warrant investment through the greenENERGY fund, adidas Group’s carbon reduction financing tool. Due to current low electricity prices, none of the retrofit proposals had the sufficient business case to warrant implementation. However, Shrago identified several operational changes that could cut energy consumption and carbon emissions, including additional staff training on the warehouse management system and changes to the software programs that control motor shutdowns. Also, Shrago established a set of best practices for designing and operating Material Handling Equipment that could serve as a guide for future project teams responsible for building new warehouses. Eric Shrago, a student at Columbia University, was hired as the 2014 EDF Climate Corps fellow at adidas.